Imagine that 24/7 from a 6'3" drag queen. That I promise you will break any Gitmo prisoner. Is that you at the beginning of the video with the giant maraca? I thought you were more hirsute. I'm not that good at playing maracas, which is why I wound up with Bruno. Obviously comrades the only real solution to this war is right in front of you all. We must enter into negotiations with the Chinese, Russians, and the French to impose an international sanction of Fox News. Once the international community has given up on Fox they will crumble under a sustained rhetoric campaign spear headed by the great leader hinself. And if that does not work we can always drop a Mother Of All Bombs (MOAB) on their broadcasting stations. We should merely pretend that Faux News is the great Unnews. It doesn't exist. We can watch Katie Couric cross her legs and sneer. We can listen to the bats fly around Dan Rather's head. We can of course listen to Janeane Gawdawfulo. But since we cannot argue with Faux News, it has to be come the Unnews. The mission was accomplished when Barry O., Lord Obama, first decided to become a community organizer. For lo, he was created until Chicago, and lo he did minister unto the thugs, and lo he did teach them to threaten bankers and banker's wives and children, and lo did he then run for state senator, and lo then United States Senator. And lo then he did attend only 147 days in the Senate, and lo did he then run for President, and lo then the Legacy Media roll over and prostrate themselves, shrieking, "Lord Obama! Lord Obama! Save us from our miserable selves!" And lo then did it surface that it was all run by his TelePrompTer. The Obama campaign's press strategy leading up to his election lastNovember focused on "making" the media cover what the campaign wantedand on exercising absolute "control" over coverage, White HouseCommunications Director Anita Dunn told an overseas crowd early thisyear. On Alinsky and The Quincux Queens™! Which expresses the limit of my PS abilities. 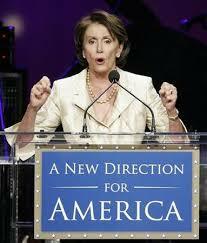 Comrade Pelosi has declared a great victory after the election. Faux Noise lies and reports smears that this was a defeat for the Great Leader. By definition the cawing of Comradette Peloski is gospel truth. Therefore Faux Noise lies. But that's all that they do. When they tell the bare facts it's not the essential truth and therefore it's a lie. Ask Dan Rather how that works. I've only just recently returned from a very special mission for his "Holiness", and find that we are on the brink of war? I guess I have alot of catching up to do, so if you aren't hearing from me too often, it's because I'm busy reading. Also my People's Personal Communicator blew up during this most dangerous encounter (we Revolutionaries are always dodging bullets and such) although I have requested a replacement, I have yet to hear from the dolts-in-charge at Central Planning™!! Guess I'll have to go over, personally, and kick in some heads? Where's Red Star and his goons when you have need of him? Heh. I just love how he's looking at the kids with a tired expression and a cigarette in his mouth. "Yeah, yeah, I appreciate your adulation. Just gimme the flowers." So inspiring. Dear Leader knows how to motivate the Children(TM). Why, where would America's youth be if he did not give them a speech extolling the virtues of education and waving stimulus money in front of progressive school administrators? Che! So good to see you back. The menus at the Hemlock Hospitality Inns are suffering from lack of attention. Red Star is quite vexed at your absence; you know that only your delectable People's Viands(tm) were what kept his SEIU goons highly trained troopers satisfied. And where's the new menu for Lucrezia's? I have lots of proles who need a last meal. and he's so neat and tidy too! 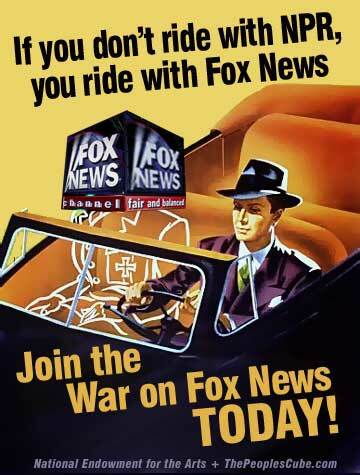 Click your remotes away from Fox News! 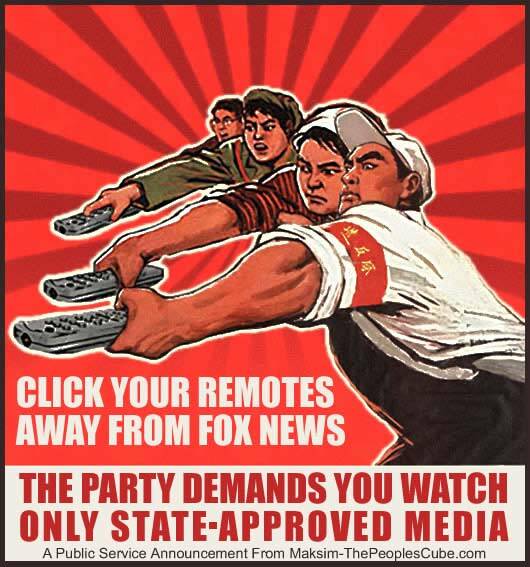 The Party demands you watch only state-approved media! So, I am assuming that this all an effort to get revenge on Clear Channel! Obama's WealthSpread™: I Can't Believe It's Not Earned!